There are a few different names for this – a financial transactions tax (FTT), a Tobin tax or more commonly in the last couple of years a Robin Hood tax. The Robin Hood of old stole from the rich to give to the poor, and his name has been appropriated for a tax that would take from the banks and give to the people, a reversal of the fiscal policy of austerity where the people have given to the banks, and continue to pay for the crisis they caused. 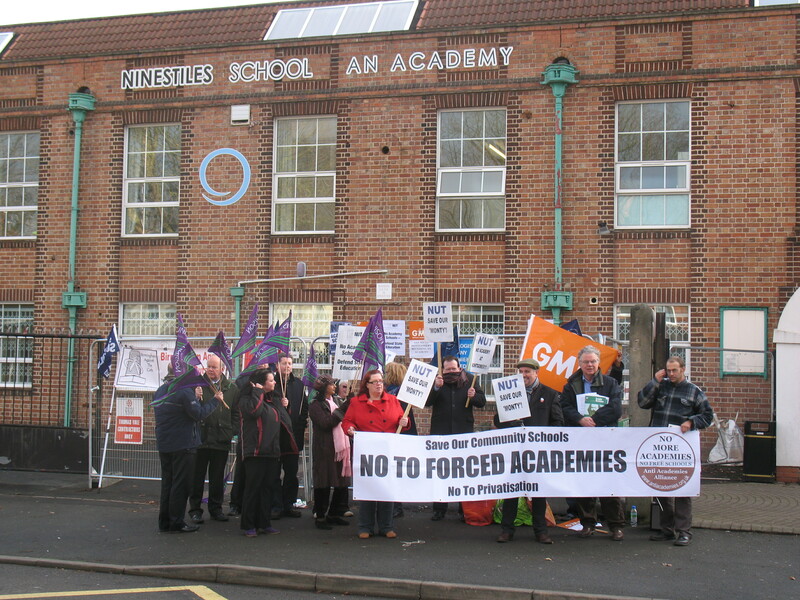 We heard late last night that Michael Gove, the education secretary, was to pay a visit to Ninestiles Academy in Acocks Green, and put the call out for people to join a protest for his lunchtime visit. Around 15-20 people made it on a weekday lunchtime, with BBC Midlands Today along to cover the protest. Unfortunately, Michael Gove shifted the time of his vist to the morning so he was gone before anyone was there to protest him – a decision presumably taken upon hearing of the protest, especially given the recent 100 strong picket at Montgomery School, which is being forced to become an academy as part of a policy introduced by Michael Gove to make more schools academies. Latest addition to Gogwit’s Blog is a reblog. Please give this your urgent attention and, if possible, support. Montgomery Primary school is being forced to become an academy, a move which both teachers and parents are opposed to. In December, all staff went on strike, and were joined by parents on the picket line. They will be on strike again on the 25th January. Hello World! Welcome to Gogwit’s Blog. Full, as I am, of beer – both dark and light – and mulled cider (my God! I rate mulled cider, even when heated in a baby burco), I am now travelling home enjoying the pretty lights that Christmas offers me, eye candy, on my journey. An interesting evening. On Twitter I have been in ‘correspondence’ with an individual under who’s skin I most obviously got. ‘Andyaj’ seems to have taken exception to my decision to strike on Wednesday 30 November and engaged in robust tweeting to this effect. Author gogwitPosted on Nov 27, 2011 Mar 16, 2012 Categories UncategorizedLeave a comment on Hello world!